Let's stick with the comfortable style trend we started yesterday and look at some soft tees. More specifically, let's look at a trend that is casual and relaxed: the drop shoulder. Such a simple detail that changes the entire look of the top. This shirt may look slubby at first glance, but try it on. It's swingy and turn around for a breezy surprise. A discreet back slit. Peachy, huh? 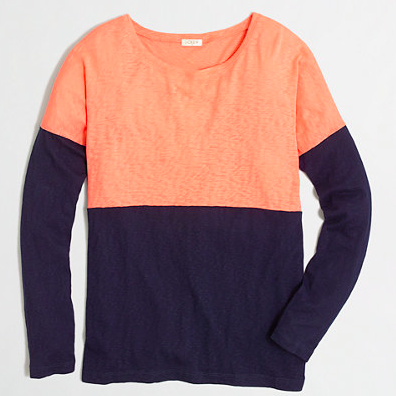 I like the combination of navy with this not in-your-face orange. Something simple that is effortless as is or dress it up with a great statement necklace. A slouchy tee with a nice update. As you can see, this drop shoulder option pairs perfectly with a pencil skirt and heels. The drop shoulder trend is a nice departure form the form fitting scuba trends or crop tops. It reminds me of the cool girl at the party that walks in and looks like she 'just threw this on' and looks incredible.